The hoopskirt first made its appearance in Spanish Court fashion in the 16th century. It was known by several different names in various countries: the krinoline, biedermaier (Germany), caged crinoline, or panier (France), and the trend lasted for nearly three centuries. The French variety, which was called the panier, got its name from the resemblance to chicken baskets at the market. The ample silk or brocade fabric, which made up the skirt, was supported by a rather elaborate structure underneath. The hoops were made from bone or wood and later replaced by steel and horsehair. 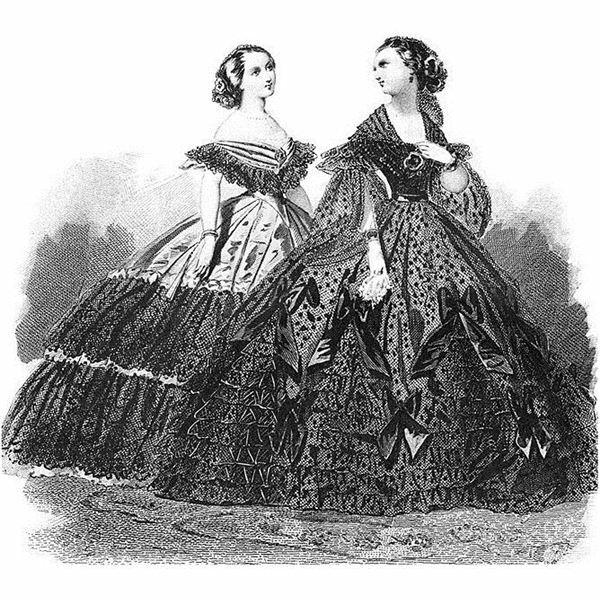 The benefit of a hoopskirt to these ladies was it was lighter in weight and much cooler than the layer of petticoats – sometimes as many as six or seven – to which they were accustomed. The purpose of these underskirts was to provide extra fullness in the skirts of dresses to create the rounded or bell shaped silhouette that was the height of fashion and to make the waist appear cinched in. Paintings by Velázquez show the extremes to which the ladies of the Spanish Court went. The hoopskirt eventually flattened in front and back and expanded at the sides, giving way to an oval shape, which made it often difficult to pass through doors head on. Ladies often had to literally “sidle” to get through a door. One can only imagine the difficulties the ladies must have experienced sitting down, not to mention getting dressed in the first place. Given the decline in body hygiene during some of the time the hoopskirt was in fashion, one doesn’t want to think too much about what lay beneath the entire outward splendor. While the hoopskirt craze has diminished, it has not died out completely: hoops and crinolines are still used under wedding gowns and some formal gowns as well as being popular costume accessories for history reenactors. In the middle to late 1800s, the bustle followed the hoopskirt. It was an understructure worn at the back and started from the waist to keep the fabric of the skirt from dragging on the floor. One function of the bustle and the hoopskirt was to make the waist look smaller and to enhance the bust. 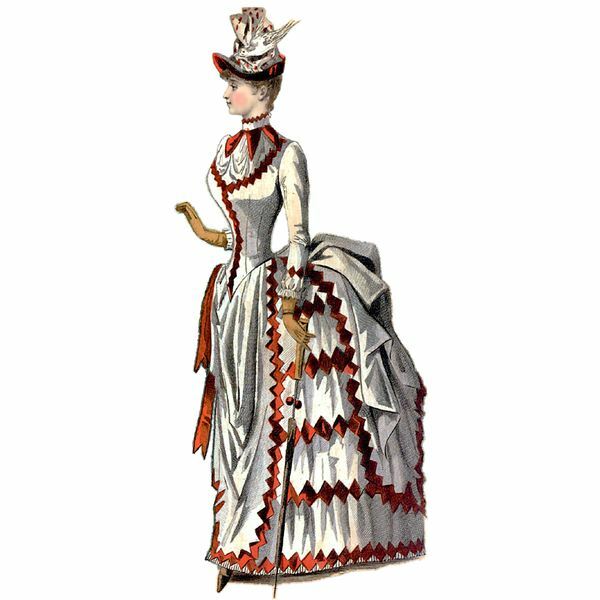 The bustle evolved as an accessory item to crinolines and hoopskirts, and its purpose was to provide additional fullness in the hip area of dresses. The weight of the fabrics used to create the fashions of the day would sometimes flatten out and spoil the appearance of the bell shape silhouette for which women aspired. Over time, the shape of the silhouette changed from the rounded or bell shape to the more pronounced fullness at the back of the skirt and through the hips, which was achieved by the use of the bustle. Like the hoopskirt, the bustle developed excesses, which gave rise to many a satiric cartoon at the time. Again, one can only imagine the difficulties for the ladies to sit down, as well as how they may have suffered quite a lot of back pain from dragging such a weight around. Another quite painful fashion was the rage during the Renaissance (1500-1600). A high forehead was considered a sign of intelligence, which led to plucking the hairline, often to halfway up the scalp. An example can be seen in paintings of Queen Elizabeth I and, of course, the Mona Lisa by Leonardo da Vinci. The plucking didn't stop at the hairline: eyebrows were eliminated too. Platform shoes have been worn in many cultures and during many periods throughout the history of fashion excesses. The oldest examples are related to ancient Greek theatre, when the most important figures wore platform shoes to distinguish them and make them more visible to the audience. China also has a tradition of platform shoes, designed to underline the rank of the person wearing them. They resurfaced in modern day fashion during the 1930s and 1940s, but then faded until the 1990s when they became fashionable again, particularly in the entertainment industry. The British fashion designer Vivienne Westwood reintroduced excessive platforms in the early 1990s, and it was when model Naomi Campbell took her well-publicized tumble wearing one of Vivienne’s creations on the catwalk that the dangers of losing one’s balance or twisting one’s ankle became apparent.